The world of Rokugan is open before you, and the samurai created by you, the Legend of the Five Rings community, is already taking shape. 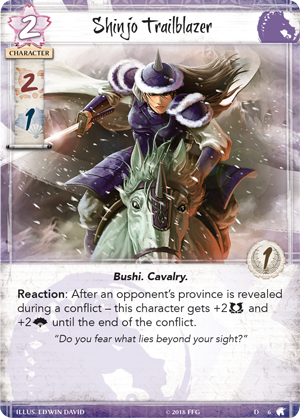 Every week, the community will vote on various aspects of a new Legend of the Five Rings: The Card Game non-unique character that will appear in a future expansion! While the final version of the card is subject to changes during playtesting, the heart and soul of the character will be defined by you. In the first vote, you determined that this samurai would belong to the Unicorn Clan, and last week, you chose the exact family that this samurai would join. Nearly 2,200 votes were cast, but the Utaku family emerged as a clear winner with over 41% of the vote. The Iuchi family was a distant second, closely followed by the Moto. 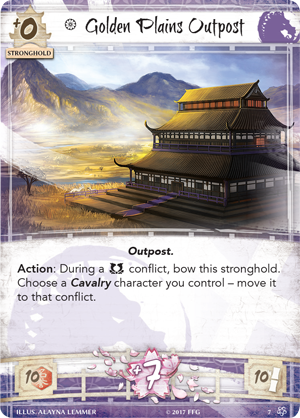 Your choice was clear, but now that we know this samurai belongs to the Utaku family, we turn to more mechanical concerns—what will be the theme of this card? 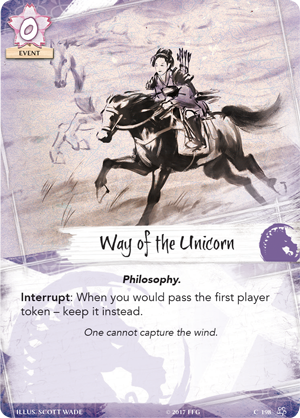 The Unicorn Clan features several distinct themes, and the theme that our samurai embraces could shape the future of the entire game! Read on for an exploration of the five options, and make sure you vote in the poll at the bottom of the article. The poll will only remain open for 24 hours, so let your voice be heard! With their powerful cavalry setting them apart from every other Great Clan, the Unicorn possess an unparalleled mobility. Slipping in and out of conflicts makes the Unicorn an unpredictable opponent. 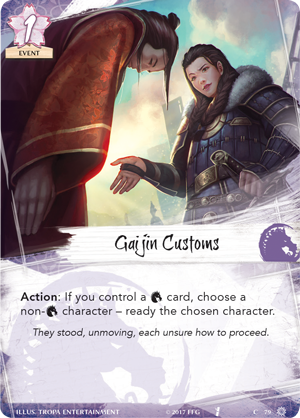 With cards like Golden Plains Outpost (Core Set, 7) and Moto Juro (Fate Has No Secrets, 89), it can be easy to move in and out of conflicts. Will the community-created samurai take its cue from this unprecedented mobility? Since the days of the Core Set, the Unicorn have had a particular affinity for being the first player. 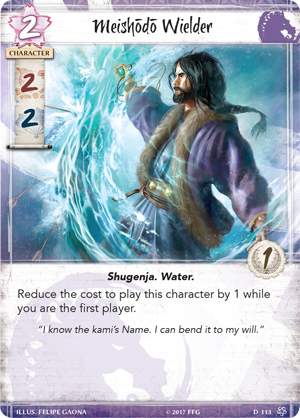 The Meishōdoō Wielder (Core Set, 113), for instance, has a reduced cost while you are the first player, while Way of the Unicorn (Core Set, 198) allows you to hold your initiative, even when you would normally pass it to your opponent. Will our Utaku samurai follow this impulsive and aggressive line of thinking? The Unicorn Clan knows that there can be great strength in numbers. Riding across the windswept plains of western Rokugan, few samurai could stand calmly and face a charging wing of Utaku Battle Maidens. 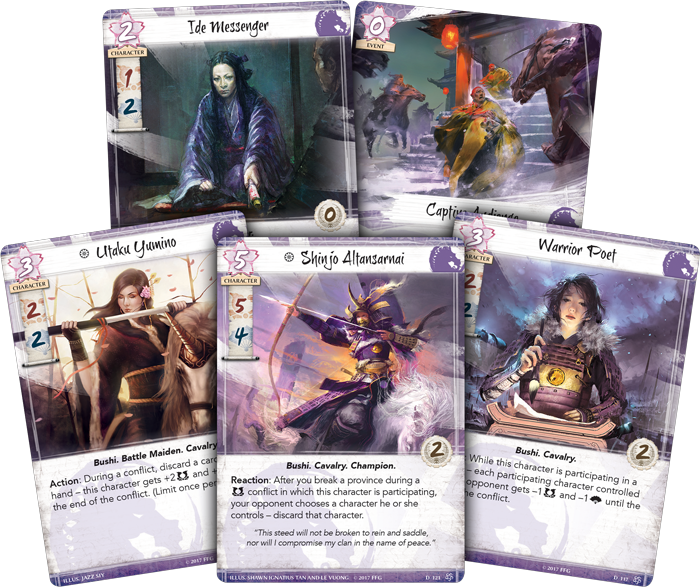 Across Legend of the Five Rings: The Card Game, you’ll find cards that reward the Unicorn Clan for bringing their full force to each conflict. 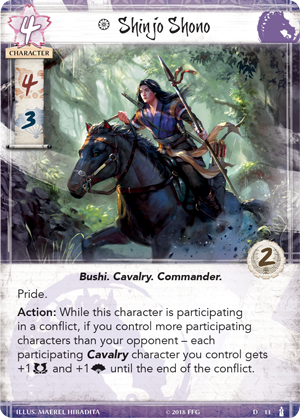 Shinjo Shono (Breath of the Kami, 11) raises the skill of all your Cavalry characters, while the Utaku Infantry (Core Set, 110) grows in strength for each Unicorn character participating in the conflict. 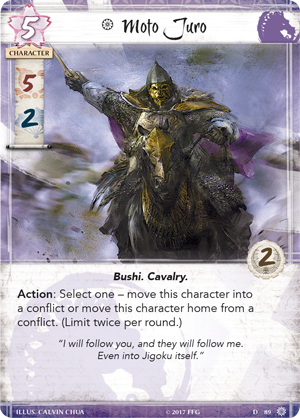 Will our samurai prefer to fight alongside a group of fellow samurai? 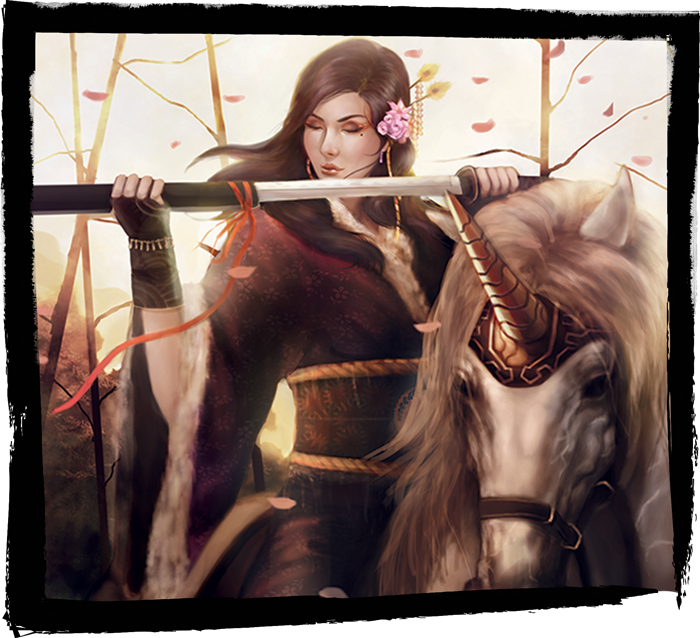 Although the Unicorn have spent hundreds of years in Rokugan, they are still regarded as newcomers by many of the other Great Clans. Indeed, the Unicorn spent centuries exploring the world beyond Rokugan, searching for threats to the Emerald Empire, and learning what lies across the burning sands and beyond the horizon. 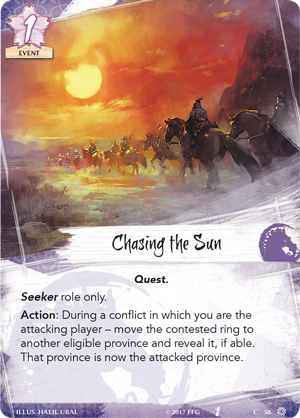 Cards like Chasing the Sun (Into the Forbidden City, 58) already invite you to venture deeper into your opponent’s provinces, uncovering the secrets you may find there. While exploration is a key element of the Unicorn's past, chasing the sun may also be their future, with cards like Shinjo Trailblazer (???????? ?? ??? ??? ?, 6) receiving a boost when they discover new lands. Will our new samurai share this thirst for exploration? In their travels, the Unicorn encountered many cultures and peoples beyond the Emerald Empire’s borders. To survive, they often found that they needed to learn from others and forge alliances that they may have otherwise shunned. Even now that they have returned to Rokugan, the Unicorn still have what many would regard as Gaijin Customs (The Chrysanthemum Throne, 79). Will our community-created samurai choose to embrace these alliances with outsiders? Consider your options carefully and cast your vote below! The poll will only remain open for 24 hours! You’ve determined that the community-created samurai will join the Unicorn Clan and the Utaku family—but what will be their role within their clan and family? The choice lies with you! 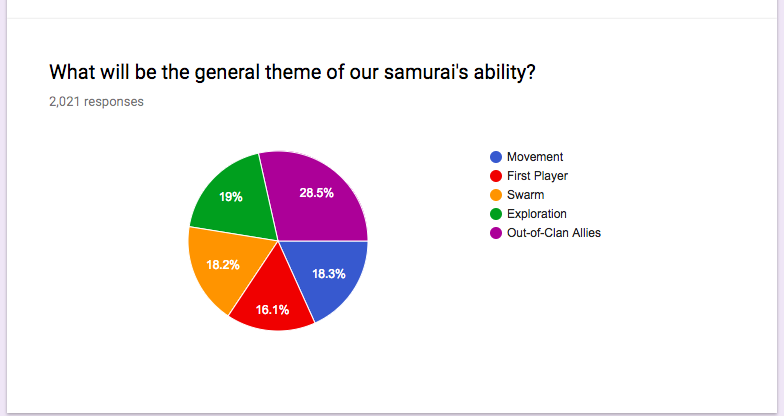 In a future article, we'll return to our samurai's theme with a list of specific abilities. Next week, join us for an exploration of our samurai's skill values! 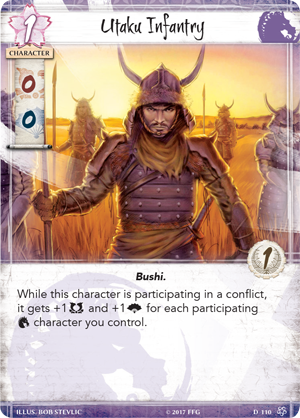 Vote in the next 24 hours to ensure your voice is heard as we take the next step in creating a new non-unique samurai for Legend of the Five Rings: The Card Game! Then, join us next week for a decision regarding our samurai’s skills.